No-one does them better. McLeod Cranes can support your next construction project with expert capability together with optimum daily hire and term hire rates. We're good at it because we work hardest to ensure safe, precise, timely results. We have cranes and transport options available 24/7. We'll work in with your team to ensure your project remains tightly on track and securely efficient. We can provide logistics support and a Structural Engineer to work with your team in lift planning. 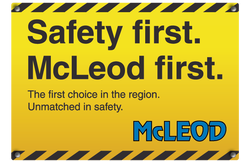 With a safety record second to none, why risk things anywhere else?